A family’s retirement fund represents years of hard work and sacrifice. When severe financial trouble plagues a household, losing the family nest egg is a serious concern. Fortunately, Congress has provided substantial protections in the bankruptcy laws that safeguard retirement accounts during financial crisis. It is important to recognize that in a Chapter 13 bankruptcy assets (including retirement funds) are not taken from the debtor. Most Chapter 13 plans are funded from earned income, and retirement funds are used only with the voluntary consent of the debtor. During a Chapter 7 bankruptcy case retirement funds are generally safe as they are either exempt or not part of the bankruptcy estate. Congress has declared that certain retirement funds are exempt from creditors during a Chapter 7 bankruptcy case. These funds include retirement accounts classified under sections 401, 403, 408, 408A, 414, 457, or 501(a) of the Internal Revenue Code. These sections cover most retirement plans and include pension plans, profit sharing plans, stock bonus plans, employee annuities, IRAs, Roth IRAs, government deferred compensation plans, plans of tax exempt organizations, and certain trusts. The laws exempt these funds to over a million dollars for each debtor. The bankruptcy laws further protect retirement accounts by providing that retirement funds not otherwise exempt are protected if they are necessary for the support of the debtor and the debtor’s dependents. The bankruptcy laws also protect certain retirement accounts subject to title 1 of ERISA, 457 deferred compensation plans, 403(b) tax deferred annuities, and health insurance plans regulated by state law. The federal bankruptcy laws provide many ways to protect your retirement accounts during bankruptcy. The key is to identify the type of account and the corresponding protection prior to filing the bankruptcy case. As always, consult with an experienced bankruptcy attorney prior to taking any action to either move retirement funds, make contributions, or take withdrawals as these actions may impair your attorney’s ability to protect your retirement account. Unfortunately, the Credit C.A.R.D. Act is also having some unintended consequences. The credit card industry is responding to these increased consumer protections by reducing credit lines and canceling many cardholder accounts without advance notice. Card companies maintain that they are taking these steps in an attempt to “tighten up” and control their financial risk. Under the present law the card company must notify you of a card cancellation “within a reasonable time” and many consumers are being surprised by a card cancellation at the register. Additionally, while the practice of “Universal Default” (raising interest rates on all cards when you default on one card) will soon be against the law, the credit card industry is implementing a new policy to restrict your spending limit or close your account in the presence of negative credit items on your credit report. In other words, if you default on one card, your cards may be canceled. Card companies are also exploring new ways to exploit their customers. CITI has announced that it will institute a $30 annual fee on certain accounts. Other companies like American Express have increased their fee schedules for late payments, and, in some cases, increased interest rates prior to the new law taking effect. American Express is not alone. A survey by Pew Charitable Trusts found that interest rates on credit cards have increased an average of two percent since last December. Fortunately, consumers who find themselves victimized by credit card companies have a powerful tool to fight back: the United States Bankruptcy Code. The bankruptcy laws protect consumers from the crushing debt that card companies enjoy placing on the average American. If you are experiencing financial distress from the abusive practices of the credit card industry, consult an experienced bankruptcy attorney and discuss your options. Reaffirming a Debt During Bankruptcy - What does it mean? The decision to reaffirm a debt should not be made lightly. A reaffirmation agreement must be made in writing before the discharge is entered. It must be filed with the bankruptcy court and the debtor must include a statement of current income and expenses that demonstrates sufficient income to repay the debt. The debtor’s attorney certifies that the debtor has been advised of the legal effect and consequences of the agreement and that reaffirmation of the debt will not create an undue hardship for the debtor or the debtor's dependents. Actor Burt Reynolds filed for bankruptcy in 1996 after his divorce from Loni Anderson. He listed more than $10 million in debt, and his dinner theater in Jupiter, Florida was foreclosed on and his ranch was sold. Never one to quit, Reynolds continues to act in movies and television. Burt Reynolds was nominated for an Academy Award for Best Supporting Actor for his performance in the 1997 film Boogie Nights and won a Golden Globe Award for the movie. Named as one of Time Magazine's "100: The Most Important People of the Century," business titan Henry Ford didn't always have the Midas touch. By 1901 Ford had unsuccessfully managed his first automobile company into bankruptcy. Two years later he founded Ford Motor Company. Walt Disney may have had vision, but he needed a second chance to make the Happiest Place on Earth a reality. After his first film company failed, Disney filed bankruptcy in 1923. Five years later Disney introduced the world to Mickey Mouse and the Disney empire was born. In 1875 a young businessman saw his horseradish company go bankrupt. Undeterred, the young man formed a new company in Pittsburgh, PA with his brother and cousin making ketchup. That company was a success for H.J. Heinz and in 2007 the H.J. Heinz Company had over $10 billion in revenue. Other famous people who have used the bankruptcy laws to help them recover from financial difficulty include: singer Willie Nelson, talk show host Larry King, actress Kim Basinger, and even billionaire Donald Trump! Don’t let financial difficulty stand in the way of your dreams! Bankruptcy will not ruin your life; it is a tool to help you build a better future for yourself and your family. consolidation, negotiation, mediation, settlement, reduction, relief, elimination, and so many others. They all make promises – some more bold than others. A few of these companies are legitimate. I want to discuss the majority of these companies that are not legitimate and how to identify debt relief scams. There are several simple warning signs to identify debt relief scams. One warning sign is when the company requires a large up-front fee. The company may even disguise that fee by calling it a “first payment.” Many consumers are surprised when that “first payment” is paid to the debt company and not paid to creditors. That can also result in a thirty day delinquency on a credit report – just the kind of damage the consumer was trying to avoid! Another warning sign is if the company makes promises that your credit score will not be affected by their program. The truth is that there is not a legitimate debt relief program available that can guarantee that your credit report will not be adversely affected. Any time a debt is not paid according to the terms of the original contract, the creditor is entitled to report adversely. The creditor may fail to report, or may agree to not report at all, but there is no way to prevent a creditor from reporting truthful information to a credit bureau. It has been my experience as a Bankruptcy attorney for the past 8 plus years that debt consolidation seldom works for consumers and normally only gets a well meaning consumer into deeper problems. Who is the Chapter 7 Bankruptcy Trustee? Quite a bit of mystery surrounds the bankruptcy trustee. Generally, the person identified as the bankruptcy trustee in a Chapter 7 case is a “panel trustee,” also called an “interim trustee.” The Panel Trustee is appointed by the United States Trustee as a local agent to review the debtor’s bankruptcy petition and schedules, and to determine if the debtor has any non-exempt assets available for distribution to creditors. The Panel Trustee is not a government employee, although he or she is supervised by the Office of the U.S. 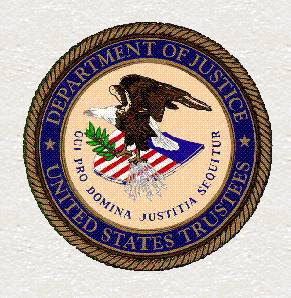 Trustee (a division of the U.S. Department of Justice). While the Panel Trustee is required to be independent and disinterested in the debtor’s case, the Panel Trustee works primarily for the benefit of the debtor's unsecured creditors. The Panel Trustee is almost always the individual that presides over the debtor’s Section 341 Meeting of Creditors. The Panel Trustee must investigate the debtor’s affairs, examine the debtor under oath, and submit reports to the bankruptcy court and Office of the U.S. Trustee. At the 341 Meeting the Panel Trustee is required to ask the debtor specific questions outlined in the U.S. Bankruptcy Code. Do you want to make any corrections to the schedules? Do you have a domestic support obligation? Panel Trustees are paid a flat fee of $60 per case. In addition, Panel Trustees receive an incentive commission on each dollar they collect from the debtor. The commission rate is: 25% on the first $5,000 distributed; 10% on the next $45,000 distributed, 5% on the next $955,000, and 3% for every dollar distributed in excess of $1,000,000. The National Association of Bankruptcy Trustees reports that approximately 90% of Chapter 7 cases are considered “no asset cases” in which there are no assets available for liquidation, either because assets are exempt (protected) by debtors or liened by secured creditors. Panel Trustees are usually attorneys or accountants with extensive bankruptcy law and auditing experience. The bankruptcy trustee is forbidden from offering legal advice to debtors in bankruptcy. Unfortunately, unrepresented debtors often do not receive the full protection of the bankruptcy laws because they lack the counsel of an experienced bankruptcy attorney. These unrepresented individuals sometimes find themselves involved in “asset cases” and under the trustee’s microscope. However, with the proper preparation, and with the experienced counsel of a skilled bankruptcy attorney, your Chapter 7 Bankruptcy can proceed very smoothly – even under the scrutiny of the bankruptcy trustee. If you are experiencing financial troubles I would encourage you to go to our website www.ShouldIFileForBankruptcy.com and see if bankruptcy may be the solution for your situation. A recent survey by the Consumer Federation of America found that debt collection issues are the fastest growing category of consumer complaints. The survey polled 34 state, county and city consumer agencies in 19 states and uncovered many abusive debt collection practices. The complete report, including proposals for consumer protection laws and tips for consumers to protect themselves, is available at the Consumer Federation of America web site, www.consumerfed.org. The results of this survey are not surprising to many bankruptcy attorneys. People in debt can face a multitude of unethical practices employed by debt collectors. Fortunately, there are some consumer protections that are available. One of the most important consumer protections is the federal Fair Debt Collections Practices Act (FDCPA). This law restricts third party debt collectors from employing abusive or unethical practices when collecting a personal, family, or household debt. * Making phone calls to an inconvenient place (e.g. contacting you at work in violation of your employer's policy). *That if you dispute the debt, the debt collector must provide verification of the debt. One of the most beneficial aspects of the FDCPA is that once you are represented by an attorney, the debt collector can no longer contact you directly. All communication must be made to the attorney. That means that once you employ bankruptcy counsel, you should no longer be called at home or at work by third party debt collectors. A violation of the FDCPA is a serious matter and may be litigated in federal or state court. If you are being hounded by creditors, investigate your legal rights. An experienced bankruptcy attorney can explain your legal rights and help you choose the best course of action.